A comfortable way to reduce hand stress, cramping, and pain associated with general craft activities. Also idea for computer users. Doctor recommended and user proven to provide relief from hand fatigue, arthritis, tendinitis, carpal tunnel syndrome, continuous motion syndrome. 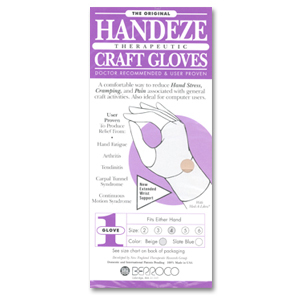 The Handeze Therapeutic Craft Gloves are manufactured from a pure Lycra fabric and treated with a special Med-A-Likra process. They are highly stretchable in all directions to insure comfort and full dexterity. To determine the glove size you need, with fingers together, measure your 4 fingers (do not include your thumb) at the hand knuckles. If your hand measures 2 1/2 to 3 1/16" order Size 3. If your hand measures 3 1/16 to 3 9/16" order size 4. If your hand measures 3 9/16 to 4 2/16" order size 5.